Today marks the beginning of a new era for the developer formerly known as Sony Online Entertainment, as Daybreak Games today unveiled its new identity, complete with new mission statement, corporate website, and logo. In anticipation of the unveiling, GamesIndustry.biz last week spoke with Daybreak president John Smedley and senior vice president of global sales and marketing Laura Naviaux for the first time since investment firm Columbus Nova bought the developer from Sony in February. Naviaux began by explaining a bit of the thinking behind the company's new brand. "It was a very exciting project to work on because we could finally unleash the company we were always meant to be," Naviaux said. "The people here haven't changed, but it was a great equalizer when we were able to move away from the Sony brand, the monolith of that company, and create our own brand identity. The name Daybreak was actually a nod to a fresh start, in addition to the nocturnal nature of gamers. We really wanted something that spoke to gaming because it's in our DNA; gaming runs through our blood as employees just as it does our players. Daybreak signifies that we look at every day as an opportunity to move gaming forward, seizing the moment, so to speak." "The people here haven't changed, but it was a great equalizer when we were able to move away from the Sony brand, the monolith of that company, and create our own brand identity." The Daybreak logo was designed to reflect that brand, with a nocturnal aspect, (the owl's eye), a technological aspect (the gear within the eye), and a more literal aspect (the "Daybreak" of a rising sun within the gear). The red, black, and yellow of Daybreak logo is starkly different from the familiar blue and white of the Sony Online Entertainment label, which might serve to emphasize a separation from the company's past. Internally, Smedley said that separation has already happened. "It's kind of nice, because the fact that we're getting the chance to make Xbox games and mobile games meant that everybody felt it was a fresh start," Smedley said. "As much as we loved being a part of Sony--it was really a great time there--the opportunity to go beyond the horizons we have is really strong at this company. We really want to get out there and make Xbox games, and make mobile games. So it wasn't just an easy transition; it was an enthusiastic one." The ability to go after new platforms was a big benefit in the separation from Sony, but Smedley said it wasn't the only one. "We can now explore things at an earlier stage that wouldn't have made as much sense at Sony," Smedley said. "For instance, we're very excited about VR. We're going to try to integrate that into as many games as we can." Of course, leaving a company with the resources of Sony has its drawbacks as well. For one, Daybreak now has to handle many of the logistical problems a startup might face, like securing corporate credit cards. It was trivial to get set up with American Express when they were part of Sony, but it's "an amusing interruption" to deal with mundane tasks like that now that they're on their own. "Not having the Sony name makes it a little harder," Smedley acknowledged. "But in a way it also makes us a little more self-reliant because we have to rely 100 percent on our games. The name 'Daybreak' isn't going to be the thing that opens the door. Sony has relationships we don't, therefore we have to do more of it on our own, which is way more gratifying." "I firmly believe the days of the WoW-style MMO are over." There have been other changes as well. Barely a week after the acquisition, Daybreak laid off employees at its San Diego and Austin locations, including director of global community relations Linda "Brasse" Carlson and David Georgeson, director of development on the EverQuest franchise. A handful of prominent developers including EverQuest Next lead content designer Steve Danuser, PlanetSide 2 producer David Carey, and PlanetSide 2 creative director Matthew Higby have left in the weeks since. Smedley dismissed any concerns about the departures. "Nearly every single person that left that wasn't part of the layoffs had been here 15 years, 12 years," Smedley said. "We have a company filled with people who have been together a very long time, and I'm proud of that fact. The fact that some of these people left and wanted to explore new things doesn't bother me, and I strongly suspect we're going to see a few of them again. In our industry, there are different kinds of games being made all the time. We're making the kind of games we want to make, and I can't blame people if after 15 years of making the same kind of games, they want to try something different. I think it was a great opportunity for them, and they're still our Daybreak family whether they're employees here or not." 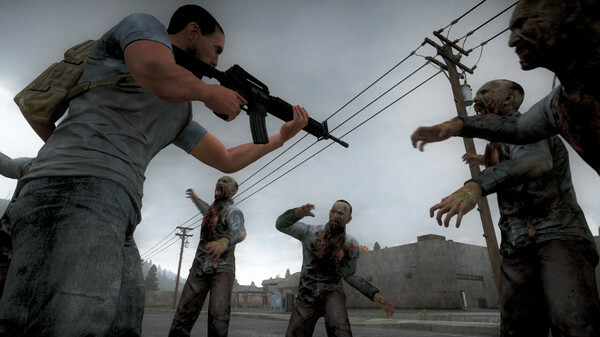 H1Z1 is currently in Early Access on Steam. While Smedley and Naviaux stopped short of proclaiming the H1Z1 business model the new standard for the industry, it's one they clearly are willing to explore further. "I think we're constantly evaluating the market when it comes to business models," Naviaux said. "We only want to sell things our consumers see value in, and those are the conversations we have at Daybreak every day. We need to run a profitable, sustainable business. We also want to please our players. There are so many things they want to buy, we're constantly taking their feedback and creating the things they want us to make, and in turn sell it. It's always a dialog. Going forward, it may be that there's an entrance fee to our games, but there will always be a microtransaction element as the industry moves more toward that. And we're seeing that even in box products. It seems like the business models are converging more and more every day and the lines are becoming more blurred. So it's going to be something we develop side-by-side with our player base." "Going forward, it may be that there's an entrance fee to our games, but there will always be a microtransaction element as the industry moves more toward that." With the opportunity to bring its games to Xbox One, Daybreak is hoping to solidify free-to-play as a staple of the console gamer's entertainment diet. It's not exactly a new goal for the company (SOE was one of the first developers to put free-to-play titles on the PlayStation 3 last generation), but it might be one whose time has come. "I think it's in its infancy and you're going to see the doors blow off it," Smedley said of free-to-play on consoles today. "There's not a lot of competition right now, so we're reaping the benefit of that. I also think that as a consumer, a gamer, when you go to open your new PS4 or Xbox One, the first thing you're going to look for is what free content is there. Having that inherently built into the console provides tremendous value, both for us as a publisher being distributed on the consoles, but also for the console at large." One factor that may have stunted the growth of the console free-to-play market to date is the creeping conservatism that happens anytime a project combines significant investment with significant risk. "The barrier to entry in the console market is typically a little bigger on the console side as it is on the PC side," Smedley said. "And because of that, I think people are a little reluctant to change the business model. The platform holders aren't; it's the developers. They're nervous about spending $20 million on a free-to-play game. And they should be. That's a dicey economic proposition. It's like making a movie and no movie like it has ever been seen before because you don't have any history to go off of. It's a new frontier for them and they both seem to be embracing it." As for what it will take to get big budget AAA free-to-play games to take off on consoles, Smedley said to check back with him soon. "I can tell you as soon as we launch Planetside 2 because that game cost nearly $30 million to make," Smedley said. "So we're putting our money where our mouth is." I hope triple AAA F2P-games remain a niche, because of the cost of these games, the pressure on the monetizing part is enormous, which will in most cases lead to very unfriendly implementation of F2P-mechanics. It's bad enough that the mobile market has gone this route, but that are only small games. At home I really don't want those games pushing out traditional Pay to Play games.